Perfect for celebratory birthday toasts, Kate Aspen's 5.75 oz. 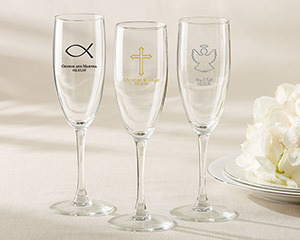 champagne flutes put the fun in functional. Customize these party favors with your name, monogram or birthday details for a charming favor guests will use again and again! A $35 set up fee is added to each personalization request for this item for creation of the artwork and design plates. Custom designs, personalization or color variations within the same order may incur separate set up fees.